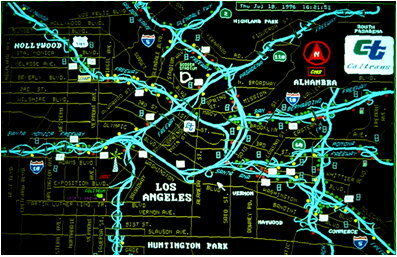 Los Angeles Freeway Operation System Design – Advantec Consulting Engineers, Inc.
ADVANTEC staff led this project that included design of a traffic operation system for I-405, I-110 (San Pedro), I-110 (Pasadena); SR-170, SR-118, and SR-101, covering over 115 centerline miles of freeway in Los Angeles. The traffic operations system included traffic control and surveillance elements, a communication system and all electronics equipment in the field. The surveillance equipment included provision of CCTV coverage on all high accident sites along the freeways. An innovative development of a “video van’ was used to survey alternative camera sites without closing lanes and expediting the camera location determination. State-of-the art camera technology was evaluated to determine the most appropriate equipment specifications, including use of CODEC to compress video transmission over narrower bandwidth. Traffic operation elements included design of ramp meters, surveillance detection stations, highway advisory radio, changeable message signs, and ancillary systems such as irrigation controller, SCADA pump stations, count stations and smart corridor interconnections. The communication system included a fiber optic SONET network interconnecting the nodes located at the hubs to the Traffic Management Center (TOC). The SONET network operates at a data rate of OC-12. At each of the nodes, add-drop multiplexers are configured as a counter rotating ring. Using a digital access and cross-connect system (DACCS) individual circuits are extracted and transmitted to the TDM multiplexers at the nodes. From the nodes, multi-mode fiber optic cables are used to form a local distribution network for the CCTV cameras, and twisted-pair cables form the local data network. For TOS elements located far from the TOC, data will be transmitted using a network of VSATs and a leased earth station. Using this network, the field elements are connected to the VSAT using twisted-pair cables or an alternative medium such as microwave or spread spectrum radio.